ADHD FOCUS MASTERY Group -Be more Productive! Highly Effective Evidence Based Program with techniques that show near 30% reduction in ADHD symptoms with just 2.5 hours of training! "I have been working with ADHD Master coach Tom for over a year now. Tom has been instrumental in guiding me towards my higher self. Through our work together I have experienced increased focus, discipline, emotional balance and overall well being. He is a very giving coach and puts his all into what he teaches. He seems to know just what you need and speaks to your highest self. Our work together has transformed my life and business immensely. Tom has helped me take my business to the next level two times now and we are working on further expansion at the moment. It feels incredible and empowering. When one is willing to show up and do the necessary practices, the results are remarkable." Overwhelmed? Unable to focus or get stuff done? Feel like you can't manifest what you know you are capable of? We got you! The core issue of ADHD is the hypersensitivity both to the environment and within our minds with fast thinking that we are not grounded. Since we do not have mastery over this hypersensitivity we do not have mastery over our emotional reactions and ability to focus, and this leads us down a path of continued failures until we feel like we are broken. The ADHD Mastery Program targets this overwhelm specifically with a unique system that is highly effective, evidence based, and is unlike anything currently out there. We help you master the hypersensitivity and turn it into a powerful gift to unlock your potential! Clients typically see major results within the first few weeks! "Tom was almost instinctual in guiding me through the process of identifying road blocks and in defining my goal in more detail. He is highly skilled at getting you to see beyond what is directly in front of you to better grasp an idea of the bigger picture. Most of all Tom is a genius in getting you to turn the road blocks into opportunity and in turning adversity into knowledge. Tom is gifted in the role of ADHD Coach. I would highly recommend him to anyone"
The Economic Impact of ADHD is near ﻿20K per year per adult and family﻿ due to medical expenses, lost work time, lost tuition, accidents, etc. 50,000% Return on your investment! "Tom Menditto is proving to be not only a patient teacher but is a very effective coach as well,getting through to me when no one else could! I have been finding more peace in my life since i started the ADHD Mastery coaching group. I never thought I would find balance in any area of my life...now, I am finding loads of peace , bits of balance and great hope for being able to manifest on the outside what I already am on the inside...that I didn't even know was there! Thanks Tom. I would never have been able to find the path without you." "Tom’s approach is open and organic. He speaks from a voice of knowing having gone thru all of this himself and more and has successfully come out the other side, making him a trusted resource of information. My meetings with Tom have brought insights that I can use to help with the everyday stressors that previously overwhelmed and have taught me techniques to use to stay positive and on track. He’s been a valuable resource to me in my efforts to grow and overcome some unique challenges and learn to use my creative energy as the strength that it is!" Imagine what overcoming ADHD will enable you do for you? What if in a few months time all your major struggles were behind you? Visual your life, and what you want. 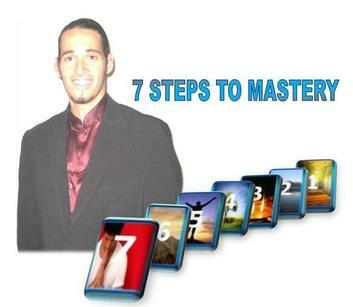 Peace, prosperity, more productivity, a book, a business, a growing career...unlock yourself! The question you have is HOW? That is where the unique system we have comes into to play as we teach you the master key to getting there! A tree can only grow as tall as its roots are deep! The key is to learn how to overcome the overwhelm, be grounded, and live in the moment. 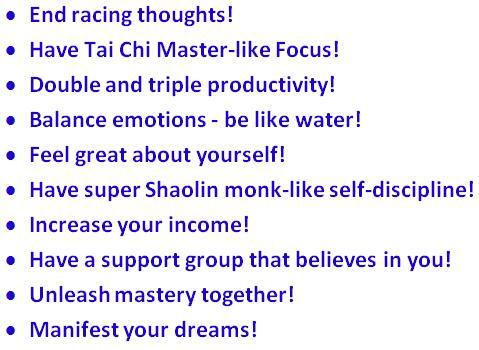 This solid foundation will led you to full mastery of all that you seek! Our program is step by step...easy to follow, practical, affordable(less than a fancy cup of coffee a day), and extremely effective with evidence based techniques that show up to 90% reduction in symptoms! This system is evidence based and highly effective at helping you overcome ADHD. Our Techniques are Easy, Fun, and get you major results within just 1 month! "I met Tom Menditto at the crossroads of his career and I must say I have never met such a sincere and determined practitioner of tai chi and the healing arts. His knowledge on how to overcome ADD and ADHD is unmatched. He by his own will and determination overcame these maladies I would believe that anyone trying to overcome these blockages and challenges would find his knowledge and wisdom priceless and filled with positive results"
Q: Do I need to make it to all group live sessions? Q: Will insurance cover it? A: If you have an HSA or FSA, then possibly. . If not, then call and ask, but most likely no. If you are self employed you can write off a portion of the coaching as business coaching as we get into a lot of that. Q: Do you work with kids or adults with other issues besides ADHD? Q: Do you work with entrepreneurs and teach techniques on business growth? A: Yes, most of my clients are entrepreneurs. I coach entrepreneurs on a daily basis, and not only teach self mastery as the key to business growth, but also very specific strategies on how to build a successful business. I have used these very principles years ago to build a full clientele booked coaching business within 12 months. Q: What are your credentials, certifications, and experience? A: Below are a list of them. -Ph.B(honorary research degree) from Univ. of Pitt. in the study of transpersonal psychology, tai chi physiology, and human potential. I specially studied peak performance abilities, impacts of tai chi and meditation on the mind, uses of mindfulness integrated into psychology for treatment of various mental illness, and how the brain has the ability to change through training and practice. I am a Master Certified Teacher with over 20,000 hours of training and coaching experience in the techniques that have been proven to be so incredible effective for ADHD and attention issues. 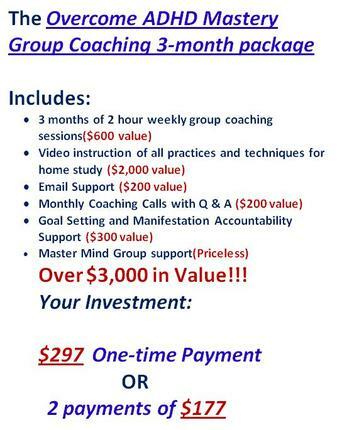 My training has come from several life coaches, mentors, business coaches, mind body masters throughout the past 20 years, and is from a 10,000 year old tradition. I come from the old school of thought that you have to have done and mastered the very thing you are looking to help others through or else you lack knowledge and experience to do it. In an effort to address this, we have launched our own certification program that sets a higher standard. The Overcome ADHD Mastery System has been taught to professionals for many years and we currently are a certifying agency for coaches, therapists, doctors, and counselors. We set the bar higher for ADHD coaching certification as we require that those wishing to teach others to master ADHD must have done the same themselves. In review of all the coaching certification course out there...we meet and far exceed the benchmarks of those programs. The ADHD Mastery System is unlike any coaching program out there as it combines mind body techniques with life coaching, and creates a fusion that is not in any of the coaching certification programs, but it has been proven to be extremely effective in studies. Since no other agency is qualified in our techniques that make our system so powerful we do not see the sense in seeking outside coaching certification. We are looking instead to offer coaches a way to evolve their practice through our 5,000 hour training program, and to help those who have overcome ADHD and wish to help others to get the recognition they deserve..
Q: Is your program evidenced based? -Tai chi showing a 30% reduction of ADHD symptoms over 8 weeks for teenagers that has lasting effects! 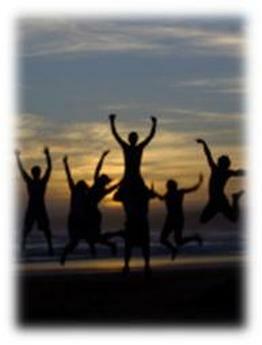 -ADHD Coaching approach leads to 60-80% reduction of ADHD symptoms over time! Q: Can I pay weekly rather than 3 months at time? A: I used to allow this until I did a study on clients that paid upfront versus clients that paid weekly. I found that clients who paid weekly were more prone to cancellation, lack of follow through, lack of commitment, and overall not really dedicated to the program. The program builds a certain momentum that needs to be nurtured, and when the temptation is there to start and stop whenever then it leads to poor results. I have found that everyone of my clients that has committed with payment has worked the system to get wonderful results! The money is really about your commitment level to yourself. We don't want to waste your money and time or my time as well. The system works if you work it, and if you are ready to commit, then we are going forward. I do not take on clients that wish to try it out. We either do it or we don't. The choice is yours! Q: Do you have references I can contact to ask about you? Overcome ADHD with a group that believes, supports, and is there for you!